** Oh, Grant Morrison, what have you done now? That's not a bad song (but I prefer the original version by Seal) but this is really my jam when it comes to music. ** CAKE is this weekend in Chicago. Over on their blog, they've been highlighting show debuts and there's a lot of good stuff that looks like will be showing up here for the first time. Also the programming is expanded with a more panels and workshops this year. I'll be there more of the day on Saturday and am really looking forward to finding a lot of great comics but I really wish I could be there Sunday morning when Caitlin McGurk interviews Jaime and Gilbert Hernandez. She interviewed Tony Millionaire at a panel last year and with her resources from The Billy Ireland Cartoon Library and Museum, she presented a great overview of the cartoonist and his art. I'd love to see her do the same thing with Los Bros. Hernandez. Hero Complex went there and they're my hero (no pun intended) for it. 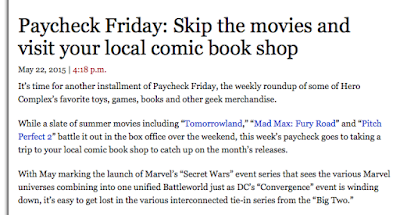 I wish more sites that covered comics would champion the originality and ideas in comics over the hit generator superhero movie articles. Of course, Hero Complex is a clearing house of pop culture so they're coverage tends to lean more towards Hollywood than towards publishing but for one bright, shiny moment, the comics reigned. ** Ed Piskor has a comic about EC Comics. I can rally relate to being unable to look at a lot of these comics when I was younger for the same reasons, trying to comprehend them through a worldview that was defined by Marvel and DC. Even today, it's much... 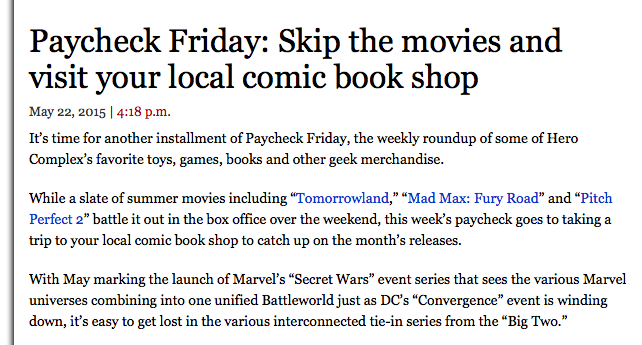 I guess the word is "easier" to read a Marvel or DC comic for me than it is to read almost anything else. It's not that I don't want to challenge but I just know those type of comics so well that I barely have to even pay attention to them to make it through them. I read most of DC's weekly series in the last year as well as Convergence but I have no idea what was going on. But Batman and Superman are just so much easier for me to absorb than a lot of other comics. It's the junk food aspect to them I guess. ** If you use the excellent Sequential app for your comics, they currently have a free collection of Gilbert Shelton's The Fabulous Freak Brothershttp://www.sequential.cc. A couple of years ago, I was able to pick up an old collection of these classic underground comics. Shelton is obviously indebted to Robert Crumb but his humor is so much more laid back and less paranoid than a lot of Crumb's stuff and it's a lot of fun to read. ** At Mangabrog, they reprint a translated discussion with Naomi Urasawa and Hisashi Eguchi where they talk about old comics. Urasawa: And because of “Fireball”, now everyone draws this way — and I mean absolutely everyone, including myself. Part of manga is about pulling things off with the bare minimum of lines needed — how a well-placed line changes the way things look. Draw a wavy little line on the back of a hand and all of a sudden you can see the angle and depth of the hand. It’s that simple, but all those lines look cool. When I met Otomo, I told him that for us, “Fireball” was our New Treasure Island [Tezuka’s first major work]. 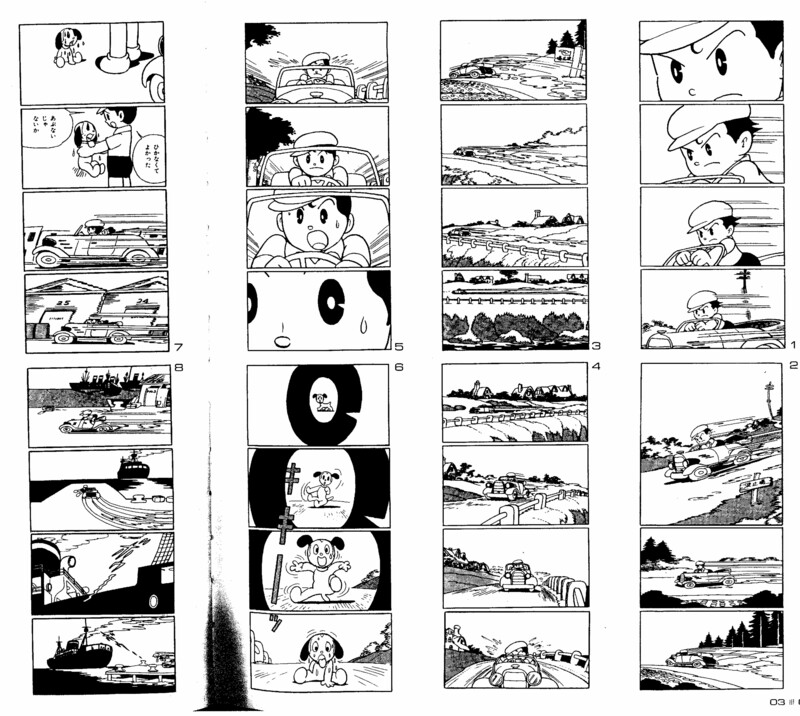 Just as Fujiko Fujio and Shotaro Ishinomori were blown away by that opening scene with the car in Osamu Tezuka’s New Treasure Island, we were blown away by “Fireball”. It opened the door. It was the beginning of the manga of our age. ** The Pattering that happened about panels this week. Rob M. reminds us that Short Run's "The Dash" grant is now open for applications. James K. quotes R.E.M. (always a strong move in my book) in his review of Broken World #1. Rob M. rolls the six-sided dice and enjoys IDW's reprint of old Dragonlance comics. Scott C. pulls his old goth gear out of the closet and reviewed The Sandman: Overture #5 at Newsarama. Mark D. hammers out the daily reviews with RUNLOVEKILL #2, Inhumans Attilan Rising #1, Secret Wars #2, The Infinity Gauntlet #1, Mythic #1 & Storm #11. James K. reviews comics one letter at a time at Comics Bulletin.